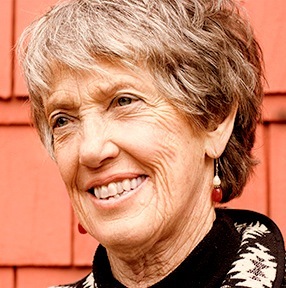 Joanna Macy, PhD, is an American eco-philosopher and scholar of Buddhism, general systems theory, and deep ecology. She is a respected international spokesperson for anti-nuclear causes, peace, justice, and environmentalism, interweaving scholarship with five decades of activism. Macy is most renowned for her book Coming Back to Life: Practices to Reconnect Our Lives, Our World (with Molly Young Brown, 1998), and the Great Turning initiative, which deals with the transformation from, as she terms it, an industrial growth society to what she considers to be a more sustainable civilization. She has created a theoretical framework for personal and social change, and a workshop methodology for its application. Macy’s other books include Despair and Personal Power in the Nuclear Age (1983), Dharma and Development (1985), Thinking Like a Mountain (with John Seed, Pat Fleming, and Arne Naess (1988 & 2007), Mutual Causality in Buddhism and General Systems Theory (1991), and Pass It On: Five Stories That Can Change the World (with Norbert Gahbler, 2010). Many thousands of people around the world have participated in Joanna's workshops and trainings. Her group methods, known as the Work That Reconnects, have been adopted and adapted yet more widely in classrooms, churches, and grassroots organizing. She has created a ground-breaking theoretical framework for personal and social change, as well as a powerful workshop methodology for its application. Her wide-ranging work addresses psychological and spiritual issues of the nuclear age, the cultivation of ecological awareness, and the fruitful resonance between Buddhist thought and contemporary science.